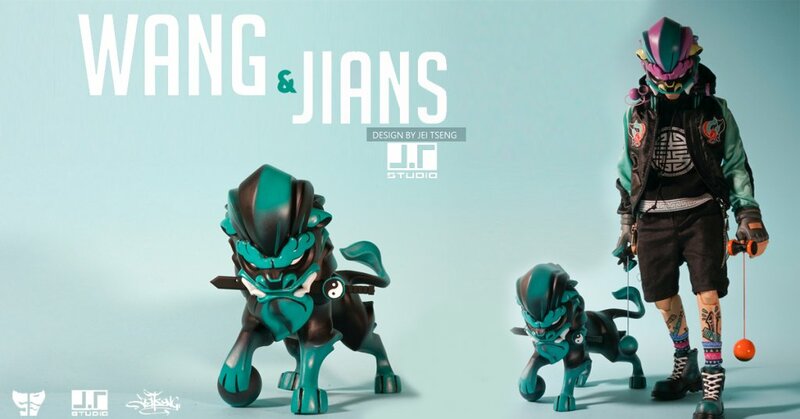 Over the past few months, we’ve seen Jei Tseng of J.T Studio’s WIP for his latest one-sixth scale figure “Wang” and his faithful companion “Jians” the Crazy D SWORDLION Foo Dog. Both made an appearance at Taipei Toy Festival 2017 back in October. The time has come for the release of both Wang & Jians! The J.T Studio Street mask series continues on another epic journey! Not to worry if you want them separately as Jei has notified us that you can own each one separately. WANG, Guardian of Crazy D in An Ping, protector who have dream not to be crush by Night M. ever since his young he been living in Tainan Anping with the culture of Jian Shi, he has a deep bonding with Jian Shi culture. In legend Jian Shi can protect people from evil, but day pass by everyone living in modern era Jian Shi culture is getting faded away slowly, WANG try to protect and keep the Jian Shi culture from forgotten by modern era, he put on Jian Shi mask and go around to compete in KENDAMA competition and keep the world the Jian Shi culture ongoing and not to be forgotten. Jian – shih is from history of Taiwan – Tainan Anping culture, Jians power can defend evil force and bring blessing. ＊Free ship and special price for preorder.